Pre-Order: GOLDEN AGE GREEN LANTERN by DC Direct! I recently mentioned the current increase in Green Lantern’s popularity thanks to the upcoming film and the starring role he boasts in the Blackest Night/Brightest Day DC Comics events. 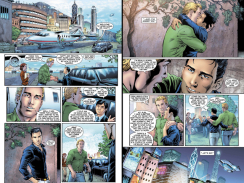 But as his future unfolds before us, why not take a look into Green Lantern’s past? Alan Scott, the Golden Age Green Lantern, was the first to discover the power of the green flame. Saved from death by a mysterious green metal lantern fashioned from a meteor, it flamed with power, fulfilling an ancient prophecy. Upon its instruction, Alan Scott formed a ring from the lantern’s metal, touching it to the lantern to charge it – and a new hero was born. The figure stands about 12 inches tall and features 28 points of articulation, impressive on a DC Direct display item and perfect for any fan who wants to add some dynamic posing to a brilliant, classic character.